This is an entry about our IPS Community Suite 4.2 release and features content specifically aimed towards developers. If you are not interested in developing for 4.2 you may wish to skip this entry. Don't worry we still have lots of exciting core feature announcements still to come. We are expanding on the already available REST API endpoints to include more support for nodes. This significantly increases the flexibility of the API and now allows forums, downloads categories, calendars etc. to be created programmatically via external sources. 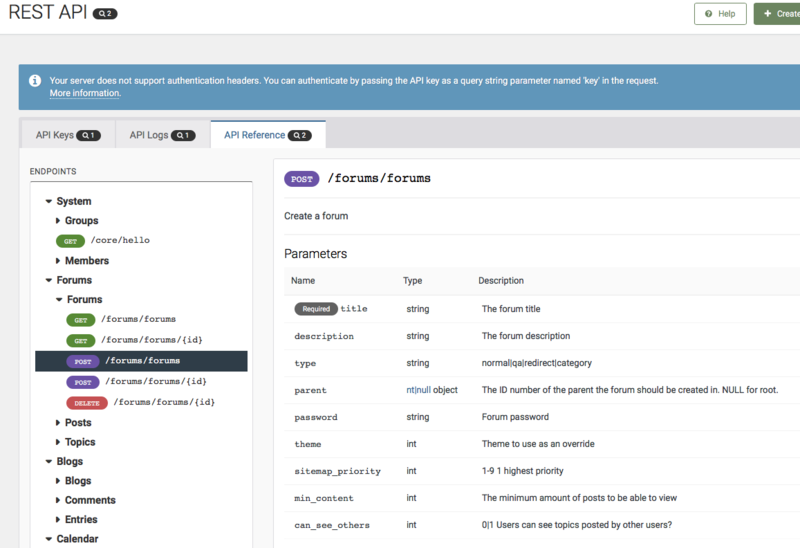 As is usual with the existing content item endpoints, access for nodes is configured via the admin control panel for each API key that is generated. For those new to the REST API, documentation can be found in the developer resources section and within the admin control panel. We are continuously looking for ways to improve developer functionality so if you have any ideas for additional endpoints or suggestions for improved documentation please feel free to share them in the comments below. We are really looking forward to seeing the new and imaginative ideas 3rd party developers can create using these additional capabilities.